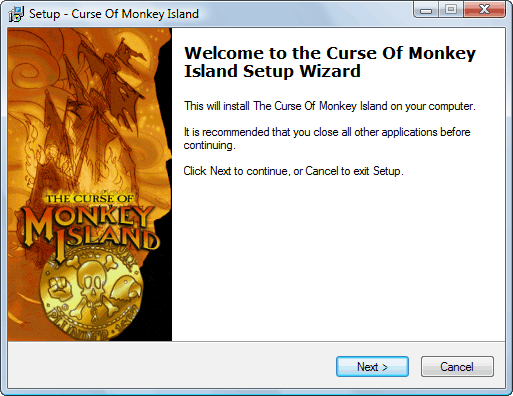 A replacement installer (setup program) for the Curse of Monkey Island. The installer that comes with the game can be problematic with newer versions of Windows and refuses to work at all on 64 bit Windows. This installer works on both 32 bit and 64 bit versions of Windows and has been tested on Windows XP , Vista and Windows 7. It should work fine with all Windows versions though. It performs a full install of the game, meaning that the cd’s are not needed to play and comes with my Curse of Monkey Island Launcher – which adds extra features beyond those in the game’s original launcher. These tools are still subject to the quirks and limitations of trying to run this old game on new versions of windows. As such there may well be bugs and problems when the game is run. While these bugs can be worked around, if you experience any problems I strongly recommend you try and run the game through ScummVM instead.